Ethics and compliance failures in major companies continue to stream across the news with surprising regularity, whether it’s deception in the automotive industry, questionable behavior by executives, or the continuing drumbeat of anti-bribery settlements. At the core of these breakdowns is the internal investigation and response system. With regulators taking an increasingly aggressive approach to incenting external whistleblowers, employers need an equally sophisticated and well-designed internal system that encourage employees to raise concerns to the employer so the company may take proper and prompt remedial action. What’s the solution? Hear what the experts say about the critical need to implement a centralized investigation function that addresses misconduct before it becomes a public or regulatory matter and learn the characteristics central to an effective internal investigation program. 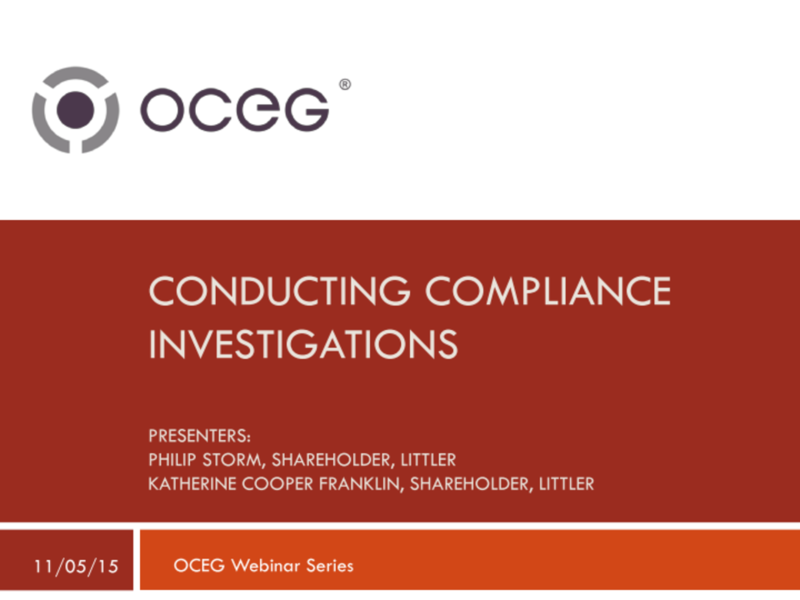 We have emailed instructions to access Conducting Compliance Investigations Slide Deck to . Make sure the email arrives in your inbox: either add "support@oceg.org" as a safe sender to your email platform, or if you use Gmail, drag our email into your Primary tab.